The interaction of two RNA molecules involves a complex interplay between folding and binding that warranted the development of RNA-RNA interaction algorithms. 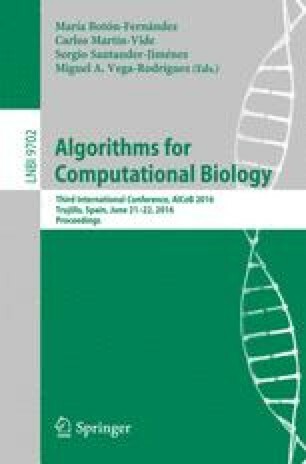 However, these algorithms do not handle more than two RNAs. We note our recent successful formulation for the multiple (more than two) RNA interaction problem based on a combinatorial optimization called Pegs and Rubber Bands. Even then, however, the optimal solution obtained does not necessarily correspond to the actual biological structure. Moreover, a structure produced by interacting RNAs may not be unique to start with. Multiple solutions (thus sub-optimal ones) are needed. Here, a sampling approach that extends our previous formulation for multiple RNA interaction is developed. By clustering the sampled solutions, we are able to reveal representatives that correspond to realistic structures. Specifically, our results on the U2-U6 complex and its introns in the spliceosome of yeast, and the CopA-CopT complex in E. Coli are consistent with published biological structures. S. Mneimneh—Supported by a Research Starter Award in Informatics from the PhRMA Foundation. Partially supported by CoSSMO CUNY. S.A. Ahmed—Supported by a PSC CUNY Award 68671-00 46.